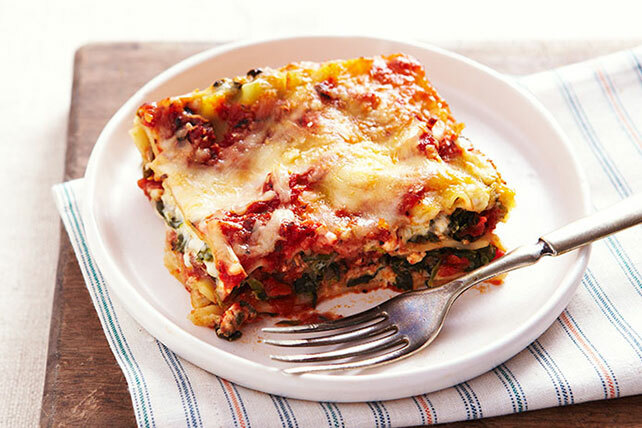 Feature a new star on the table with our Spinach Lasagna Recipe. Our scene-stealing Spinach Lasagna Recipe features cheesy spinach, noodles and mozzarella. Mix eggs, cottage cheese, spinach, 2 cups mozzarella and 1/4 cup Parmesan until blended. Spread 1 cup pasta sauce onto bottom of 13x9-inch baking dish sprayed with cooking spray; cover with 3 noodles and half the cottage cheese mixture. Repeat layers. Top with remaining noodles, pasta sauce, mozzarella and Parmesan cheeses. Bake 45 min. or until heated through. Remove from oven. Let stand 10 min. before cutting to serve. Serve with a whole wheat roll, crisp mixed green salad, and fresh fruit for dessert. Prepare using BREAKSTONE'S FREE or KNUDSEN FREE Fat Free Cottage Cheese.